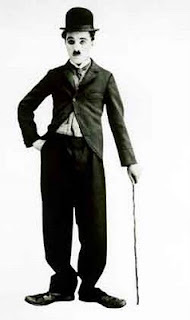 Marshall McLuhan's comments on Charlie Chaplin's Little Tramp "mask" are relevant to our CATTt, providing a relay for synthesizing Event (as subject position), Conceptual Persona, Appropriation, Cliche. The character in a mask is "putting on the audience" rather than expressing his personal feelings. Thus Charlie Chaplin did not spend his life expressing his personal feelings. Like any artist, he selected from the environment of his audience the equipment he needed. Chaplin chose only a small group of items: the costume of the middle-class nobody, the hidden gestures of the music-hall entertainer, the romantic outlook of Cyrano, the unlovable lover, and the foot positions of classical ballet. It was this latter inspiration that gave the bizarre highbrow aura to Chaplin's mask. To get into a role as opposed to merely having a job, is to put on the corporate social power of one's culture. In our still very literate society many people continue to seek corporate power by matching appearances. This has exactly the opposite effect from what is desired. It dilutes rather than enriches the experience, just as competition encourages people to resemble one another. The genuine role-player, on the other hand, doesn't have any competition whatever, since the items he selects from the environment from which to create his image are of the utmost inclusiveness. (McLuhan, From Cliche to Archetype). In our case, however, there is no need to choose between "mask" and "expression," in the context of electrate identity formation, experienced as "extimacy" (the outside is inside). The construction of our persona works through the middle voice: We experience our collective subject position of event by means of the appropriated bits selected and combined into routine. a delight to read. i'm put in mind of the contemporary Concept Persona "reverend Billy and the Church of Stop Shopping"